I forget exactly what led me to read it. I was jumping back and forth from Buzzfeed, Tumblr, Huffington Post and Thought Catalog (as you do in the wee hours of Saturday morning). But I eventually stumbled across this article. I read it out of boredom, at first. I related with the title and thought, "Meh, why not? It's 2AM and the struggle with potential insomnia is real." The deeper I got into the article and Katie Heaney's "Lighthouse Theory," the more I realized that I felt the same way towards my other girlfriends. They were lighthouses and I was, for some reason, a Bermuda Triangle. I bought Never Have I Ever that same night. Katie's premise is simple: she was 25 years old and despite all her crushes and "experiences" with different guys, she was still very single and nowhere near being in a relationship. And, sure, I knew that statistically-speaking she and I weren't the only two people in the globe that were 25 and single, but it was enough for me to pick it up. 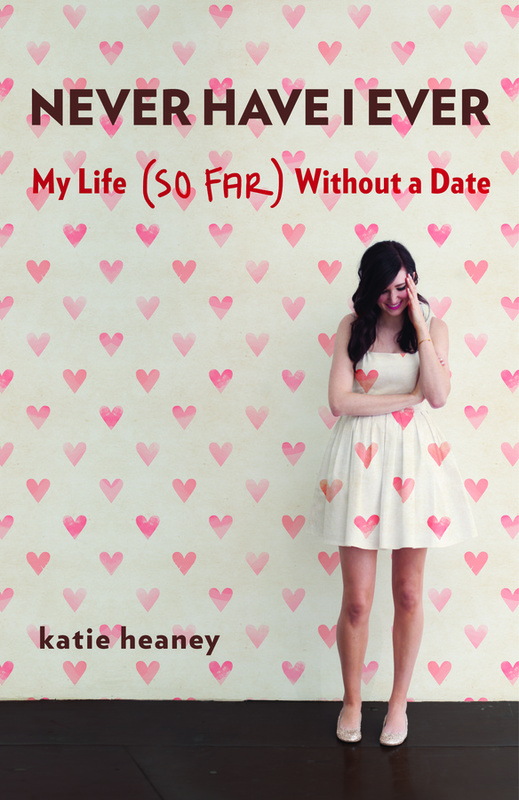 Within the first couple of chapters, I was convinced that Katie was my American Doppleganger--at least in the love (or lack of love) life department. It was as if she had been living a mirror image of my own experiences. I remember thinking near the tail-end of the book, "Well, she hasn't done a chapter on online dating..." and five or so pages later, BAM, there it was. So, change the names, switch the locations, tweak it here and there, but keep the humor and the over-analytic thoughts plus the "WTF did I just do/say" actions, and viola, you've got a Never Have I Ever Volume II by Mishie Del Rosario (hmm, let me revisit this idea later). I've already lost count of a number of things while reading this book: my wide-eyed "Oh my God that's exactly like me!" reactions, "I know how that feels like" smiles, "Aww man, I know exactly how that feels like" slow head shakes, and most of all the "Me. I'm reading about me," thoughts. More than the experiences that Katie recalls in the book though, the one thing that made me relate to her stories the most is her humor. Mayhaps because it is almost exactly like mine in that she (in hindsight) sees this stories and tells them in a self-deprecating, sarcastic manner--or maybe the quirky side comments she adds (I too have a tendency to get carried away with side-comments. I have way too many thoughts in my head). You just don't think that way in the process of these events unfolding, but this tongue in cheek humor that she adds in the retelling of them entertain me the most, as if I were telling my own stories to people. And apart from her misadventures with boys are her girlfriends that she takes along for the ride. Somewhere past the middle of the book, in her section in grad school, she gives all her girlfriends roles to play whenever she is over-analyzing and freaking out over a guy: the level-headed, logical best friend that just tells it like it is, the uber optimistic friend that is convinced it is meant to be, the friend that freaks out along with you and justifies your craziness and a couple of back-ups that may or may not actually be as invested in your love (or lack of love) life. This part elicited my wide-eyed "oh my God that's exactly like me (and my best friends)!" reaction. They know who they are, and what role they play, and they know me. It is a highly enjoyable book that I've found myself reading anywhere: in bed, on the train, on the bus and during lunch (okay, maybe not during lunch where I might tempt someone to ask me what the book is about and why I like it). The only thing that I was unsure what to feel about was the Epilogue. I suppose I didn't really know how she would end it. Obviously her life continues, and I couldn't really see how she would end it properly apart from eventually finding a long term relationship. Part of me thought that it sounded like a cop-out. Katie made it sound that she had just learned to accept herself for who she was, a single learn who just did not know how to get herself into a relationship. It might have had more impact if I didn't already think that way about her all throughout the book. I thought of myself, about being too similar to her. I had always been that way: an overthinker that knew what I was expecting and what I wanted, even if it did not seem realistic to other people that have actually been successful in dating people for longer than a couple of dates. I don't know, I just felt that there could have been a different way to do it. But then again, maybe that's also be being idealistic, not real. Maybe there really isn't a way to properly end it because there isn't much to end--her trying to find a date still continues. But there's the rub: while most people will stop right there--simply enjoying the book, putting it down after and shelving it maybe permanently--I will do the usual me when it comes to anything that hits close to home, I analyze. I think. I over think. Guh. By the way, this is where the review ends and the bonus (?) material begins. Soooo, I'm like Katie Heaney. 25 years old, now working my way up the ladder, had my fair share of struggles with guys (see below GIF that illustrates perfectly my struggle with crushes). I have accepted that part of me, but now what? Just because I've come to terms with my past, doesn't mean that I am willing to continue on this way for the rest of my life. Okay, not the rest of my life--until further notice. The dilemma is, though, that I perfectly happy with the way I am, thank you very much (except the over-analytic part of myself. I'd like an adjustment with that very much thanks). I am single, but having someone would be nice. Not necessary, but nice. I don't need someone, but would I say 'no' if I were asked "do you want a boyfriend?" I honestly doubt it. I have survived by myself for 25 years, you know, having a partner-in-crime doesn't sound like a bad idea to me. Besides, not to brag, but I feel like the cumulative experiences of my friends has taught, armed and maybe even molded me into being what I imagine to be an effing good girlfriend. I also know this for a fact because I have none of the signs from this totally legit list. That doesn't mean to say that I'm desperate and will just say 'yes' to anyone right away. I have some dignity, I know that I'm a catch. But we'll see. No amount of planing, hoping, wishing and wondering will make any of it come true. So, we'll see. Either way I know when the time comes, by entourage of girlfriends will be there to back me up (or confuse me even more) along the way. Now let me revisit this Never Have I Ever Volume II idea.